It’s a busy overnight and the nurses are speedily wheeling a gentleman from triage to the resuscitation bay. “It’s an allergic reaction, come quick!” You take a look at the patient: no respiratory distress, no lip swelling, no facial swelling, no hives, seems pretty comfortable. You ask a question and the patient has a hot potato muffled voice and seems like he has something stuck in the back of his throat. No wheezing, satting well on room air, no trismus, the patient opens wide and all you see is uvula: edematous, enlarged, looks like a very large grape. The patient is tolerating his secretions well otherwise. Is this an allergic reaction w/no other systemic symptoms and no clear precipitant? Is this uvulitis? Is there a peritonsillar abscess? Does this person need to be intubated? A male took a few shots of aged whiskey prior to sleeping then woke up a few hours later with a swollen uvula, no other allergic symptoms. He improved with IM epinephrine x3, NP scope showed normal appearing epiglottis and vocal cords; he was admitted to the ICU for close monitoring and had resolution of symptoms within 24 hours. An older gentleman on an ACE-inhibitor presented with 2 weeks of sore throat. He had isolated uvular edema years ago after drinking vodka. He avoided vodka since then, but drank tequila the night prior to presentation and woke up with a grapelike uvula. We treated him for infectious and allergic causes and he was also admitted for respiratory monitoring. A man in town for business who had previously had uvular edema and was usually able to manage his symptoms at home with Benadryl and IM epi, but had forgotten his epi pen in a different suitcase. He improved after steroids, epinephrine, antihistamines. After a period of observation he wanted to leave. We discharged him with steroids and an epi pen and recommended he follow up with an allergist. Epiglottitis – fever, drooling, anxiety, airway obstruction, think of kids, get lateral neck films and be careful examining the kids- they need to be kept calm as agitation can worsen airway obstruction! Peritonsillar abscess – tonsillar swelling, deviated uvula, fever, sore throat, trismus, hot potato voice (only 1 case of uvulitis w/PTA has been reported). Drugs – inhaled cocaine, cannabis, herbal medicines like the juice of the squirting cucumber or Ecballium elaterium, used as a homeopathic remedy for sinusitis. Can be the exposure itself or as a result of thermal injury. Hereditary angioneurotic edema (HANE) – autosomal dominant genetic form, lack of C1 esterase inhibitor protein, think about w history of repetitive episodes of uvular edema, family history, confirmed with blood samples showing low C1 esterase levels. If suspected, can use bradykinin receptor antagonist (Icatibant) or complement C1 inhibitor concentrate (Berinert, Cinryze). Most cases are case reports and involve exposure to drugs, inhaled substances. Rhinolaryngoscopy to rule out epiglottitis if patient is not improving over time; might be a good idea to have the ETT loaded onto the scope just in case there is cord edema or acute airway obstruction during the procedure. If intubation is needed, the uvula will certainly be in the way so reach for the fiberoptic scope or just clamp the uvula and pull it to the side. This blog post is an interesting discussion about the patient presenting with isolated uvular swelling. The uvula is the fleshy structure that hangs from the soft palate in the posterior pharynx. It is composed of glandular and connective tissue with interspersed muscle fibers. Seromucous glands within the uvula produce much of the total volume of saliva. Patients presenting with uvular complications will often have some combination of dysphonia, dysphagia, and dyspnea. The underlying cause of uvular swelling can be due to trauma, infection, inflammation, and angioedema due to allergic reactions and non-allergic mechanisms. Performing a comprehensive history and physical will often help provide guidance about the cause of the problem. However, up to half of all cases of uvular swelling will have no identifiable cause. Trauma to the uvula can occur as a result of direct physical contact, thermal or cold exposure, and vibration (as with snoring). Uvular hematoma has been seen in cases of thrombolytic administration. Isolated infection of the uvula is very uncommon. It usually occurs in the setting of more widespread infection as with pharyngitis, tonsillitis, or epiglottitis. Pathogens responsible include Haemophilus and Streptococcus species as well as due to candidal infections. Angioedema is a term that describes the physical exam finding of transient, nonpitting swelling of subcutaneous tissue or of the submucosal layer of the respiratory or gastrointestinal tracts. Isolated uvular angioedema has been called Quinke’s edema in recognition of Heinrich Quinke’s contribution to the understanding of angioedema. Most forms of angioedema result from increased levels of either histamine or bradykinin. Histaminergic angioedema is typically allergic or immunologic. Bradykinin-mediated forms of angioedema include hereditary angioedema, acquired angioedema, ACE-inhibitor induced angioedema. The term “angioneurotic edema” is archaic and refers to the earlier belief that angioedema was the result of neurologic or psychiatric disturbances. Differentiating between histaminergic and bradykinin-mediated forms of angioedema can be difficult due to the lack of available testing in the Emergency Department. Histaminergic forms may be associated antecedent exposure to a possible allergen and subsequent development of urticaria and pruritus whereas bradykinin-mediated forms are not. Regardless of the cause of uvular swelling, the most important component of treatment is airway management. There is no definitive point at which it can be clearly determined that a definitive airway needs to be obtained. The decision must be made based on a combination of factors including rapidity of disease progression, anatomic considerations that may make intubation more difficult and equipment available to the clinician. Once the decision to intubate is made, it should be performed by the most experienced provider with anticipation of a difficult airway. Many experts suggest preparing a “double set-up” where the neck is prepped for a cricothyroidotomy in the event of a failed airway. Performance of nasopharyngoscopy is somewhat controversial but I believe that it is of great importance to fully understand the extent of disease. The clinician should be aware that any physical manipulation of the airway may result in worsening of the swelling and therefore he or she should be prepared to immediately secure the airway. Frequently, cases are treated with a shotgun approach where patients are treated with epinephrine, steroids and antihistamines. In cases of hereditary angioedema there are now a number of FDA-approved medications that act by replacing C1 esterase inhibitor (C1-INH), inhibiting kallikrein mediated breakdown of high molecular weight kininogen (HMWK) into bradykinin or inhibiting the bradykinin B2 receptor. Despite case reports and case series none of these have been shown to be effective in ACE inhibitor induced angioedema. Fresh frozen plasma contains both C1-INH and angiotensin converting enzyme (ACE, also known as kininase II), which may help to reduce the swelling associated with bradykinin-mediated forms of angioedema. FFP also contains HMWK and kallikrein, which may result in increased formation of bradykinin. Any concern for infection should prompt the clinician to provide appropriate antimicrobial or antifungal coverage. Any patient that has swelling involving the airway will need close monitoring until the swelling resolves. Most will require admission to an intensive care unit where prompt airway management can occur in the event of clinical deterioration. In 1999, Ishoo et al performed a single-center, retrospective review of patients admitted over an eleven-year period with angioedema due to all causes. They found the following factors were associated with an increased risk of need for definitive airway: voice change, hoarseness, stridor and dyspnea. 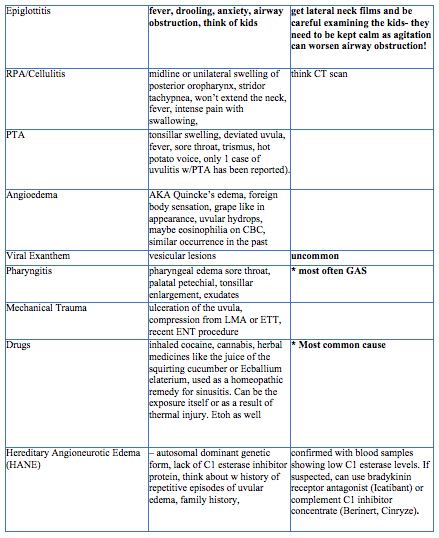 Patients were categorized by the location of angioedema into 4 non-continuous stages. Application of this categorization has limitations as there have been numerous advances in management in the two decades since this was published. Evans TC, Roberge RJ: Quincke's disease of the uvula. Am J Emerg Med 1987;5:211-216. Rasmussen E, Mey K, Bygum A. Isolated oedema of the uvula induced by intense snoring and ACE inhibitor. BMJ Case Reports, vol 2014; 2014. Roberts J. Acute angioedema of the Uvula. Emergency Medicine News. 2001;23(7):7-12. Welling A. Enlarged uvula (Quincke’s Oedema) – A side effect of inhale cocaine? – a case study and review of the literature. International Emergency Nursing. 2008;16(3):207-10. Posted on September 3, 2018 by NUEM Blog and filed under ENT and tagged uvula edema difficult airway.